I still miss the '70s style collared costume... but this one is starting to grow on me. Funeral For a Friend. Superman s Funeral. Ha! Thanks for that SNL blast from the past, Chris. Although not Sinbad, your Black Lightning sizzles with intensity. Kudos! Alex loves his commission. Thanks so much! 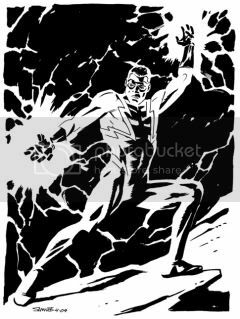 Ask him whose his favorites superheores right now, he'd say Black Lightning and Chris Samnee!! We got a kick out of the SNL blast from the past! Classic stuff!! Alex kept asking why Lois keeps wanting to know where Clark was if Superman was dead :). He said "shouldn't she know- HE'S DEAD"!! !